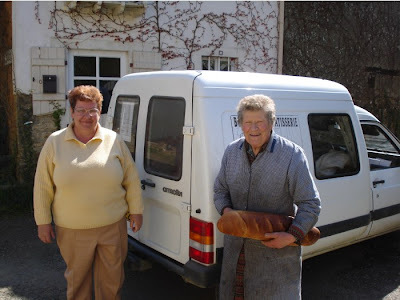 Twice a week, just before midday, a little white Citroën van pulls up our lane, accompanied by two or three hearty parps on its horn and parks outside our gite: it’s Nadine, sister of Jacky our boulanger, delivering bread. I think she provides a greater social service than the mere delivery of bread, as she takes time to chat with her customers, often elderly, who perhaps don’t otherwise get the chance to talk to too many people. The venerable Annick doesn’t fall into this category and is more than able to collect her own bread yet will never fail to meet up with Nadine, buy a long pain and natter for a few minutes (in the photo, Annick is on the right). One day last week, I happened to be passing with our billy goat on a lead. I only tether him if I’m working next to him and I’d let him get tucked into a patch of brambles while I was constructing some more stock fencing nearby. It was time for lunch, so I was retuning him to his field. When I got to the bread van, I stopped to say my “bonjours” to Nadine and Annick and I explained that the billy was my débroussailleuse (strimmer). “Très écologique” they said and then Annick went on to explain how I would be effectively eating my own hedge as the billy eats the hedge and then we eat him, which put me in mind of a passage from Shakespeare’s Hamlet. Hamlet is playing with words and ideas as he describes how a dead king, buried, will be eaten by worms, one of which might be used as fishing bait. What does thou mean by this? 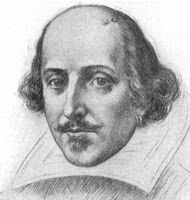 Which is all to say that the next time you pass by the quotidian French rural scene of an elderly country lady gossiping with the bakery delivery woman, don’t be mistaken, they’re operating on the same intellectual level as William Shakespeare! Surely that is not a 'long pain' which the venerable Annick holds, but a 'pain deux livres', literally 'a two pound loaf'! From the French Bread Pedant.